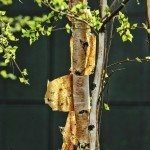 should we peel off loose bark? Large pieces are peeling. Can we spray it? I once saw a can of spray (it was like tar). Is that helpful?